Traditional Southern Style Cornbread is a staple in my kitchen and is perfect to pair with chili, stews or soups. It’s also the base for my Traditional Southern Cornbread Dressing and Make-Ahead Cornbread Dressing with Pecans and Sausage, and it is delicious paired with with Southern Hoppin’John or Southern Black Eyed Peas for New Years. 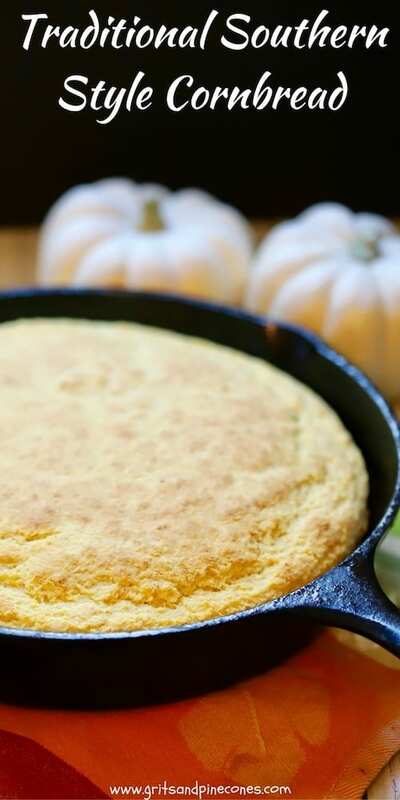 This cast iron skillet cornbread made with buttermilk and stone-ground cornmeal is full of rich corn flavor, and it has a deliciously crunchy crust. Not only is it easy to make, but it is also amazing straight out of the oven topped simply with a pat of butter. It also freezes beautifully, and I already have several pans of it baked and in my freezer in anticipation of making Traditional Southern Style Cornbread Dressing for Thanksgiving. 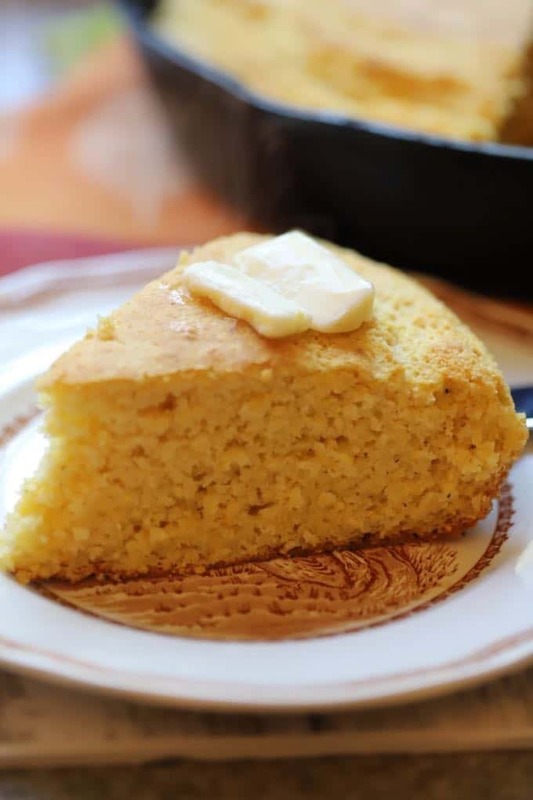 I also have two other cornbread recipes on my site, gluten-free Old Fashioned Southern Cornbread which is a tasty, dense cornbread which doesn’t contain any flour. And, I have spicy and flavorful Mexican Jalapeno Cornbread which goes perfectly with my Super Simple Chicken Chorizo Chili, and Best and Easiest Turkey Chili. Also, if you are a lover of cornbread like I am, my recipe for Hoe Cakes aka Cornmeal Pancakes will make you swoon! 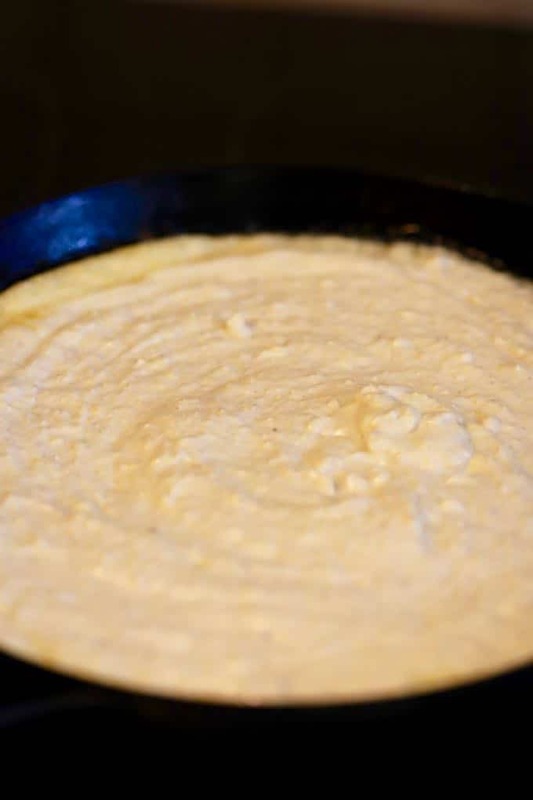 This staple of early America is a type of cornmeal pancake that is quick and easy to make. It’s also frequently served with southern peas and greens to “sop up their pot likker.” For those of you that don’t know, “pot likker” is a Southern term for the liquid that greens and peas are cooked in. 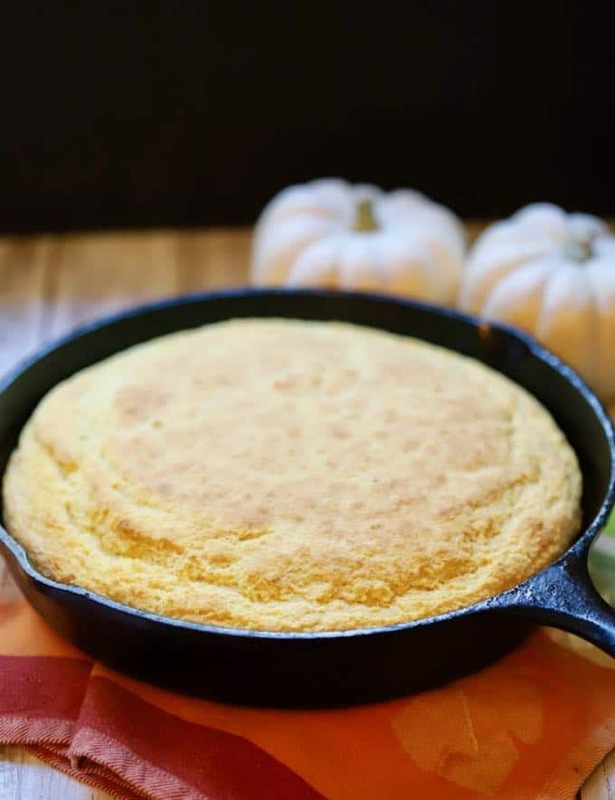 You will need the following ingredients to make Traditional Southern Style Cornbread: stone-ground cornmeal, all-purpose flour, baking powder, baking soda, kosher salt, buttermilk, eggs, and vegetable or peanut oil. Generously oil a 10-inch cast iron skillet or cake pan and place in oven to heat for 5-10 minutes. 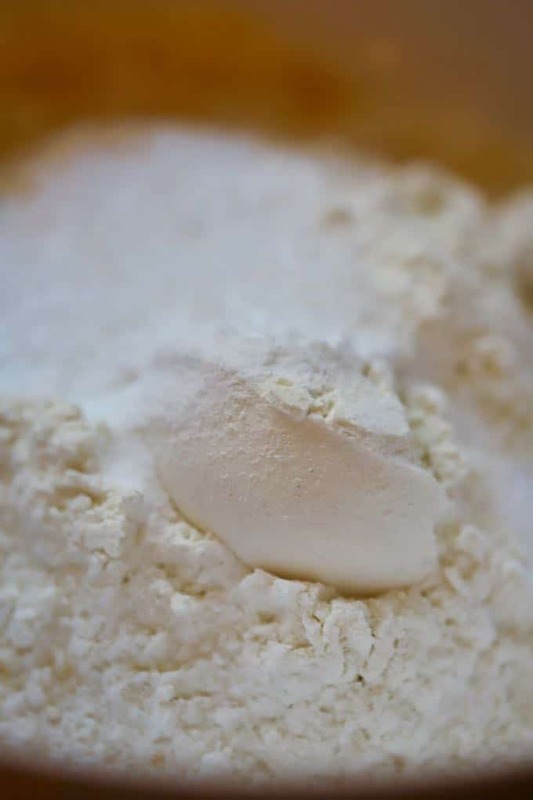 Add the cornmeal, flour, baking powder, baking soda, and salt to a large bowl and whisk together. Set aside. In a smaller bowl, mix the eggs, buttermilk, and vegetable oil. 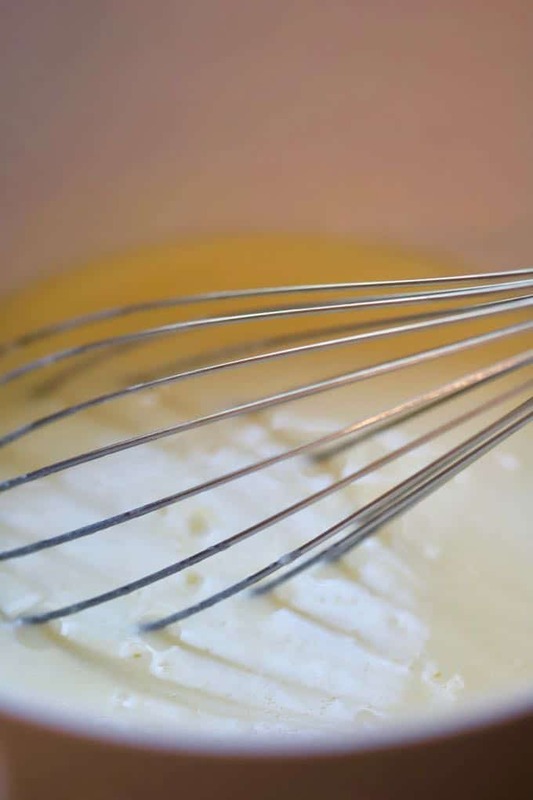 Add the wet ingredients to the dry ingredients and stir to combine, just until the batter is moistened. Do not overmix. Carefully remove the heated skillet from the oven and pour in the batter. Bake for approximately 20 minutes or until the cornbread is golden brown, and the center springs back when pressed. If you liked the recipe above, please consider rating it and leaving a comment below. Also, follow me on Pinterest, Facebook, and Instagram. And finally, to be the first to receive new notifications of new posts by email, enter your email address in the Subscribe box. 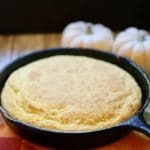 Easy Traditional Southern Style Cornbread made with buttermilk and stone-ground cornmeal and is full of rich corn flavor, and has a deliciously crunchy crust. Add the cornmeal, flour, baking powder, baking soda and salt to a large bowl and whisk together. Set aside. If you are making the cornbread to make cornbread dressing, let it cool completely and wrap tightly until ready to use, or freeze up to 30 days. Hot cornbread is also delicious crumbled up in a tall glass of buttermilk! This looks SO darn good- I think I could eat the entire pan in once sitting TBH. Buuut another option would be alongside all the fall soups or a good chili.Can’t wait to try! Thanks so much Carly, I know, I almost did eat the whole pan after I took the pictures! It is delicious! What brand of cornmeal do you recommend? Thanks so much for your question! I usually use cornmeal that is produced locally here in Tallahassee, FL. My favorite is Bumpy Road Farm or Bradleys General Store Stone Ground Cornmeal. However, I have used Dixie Lily and other commercial brands with equal success! Hope this helps. My husband’s niece made it for labor day weekend party and even my picky eater 4yrs old loved it! Today I’m making it too! Can’t wait to try corn bread dressing next! Hi Ewa, thanks so much for letting me know and I’m so glad your family enjoyed it. I think you will love the cornbread dressing too! I’m making this for cornbread dressing. I just popped it in the oven. I appreciate the simplistic, traditional recipe. There’s so many good ones out there, but this is really what I wanted for my first homemade dressing. I think I will even try a little in a glass with some buttermilk Thank you! Thanks so much for letting me know. I hope it turns out well for you! And, you are smart, making it now and freezing it for later too! Good luck and Hally Thanksgiving to you! This cornbread recipe will be used to make the Traditional Southern Cornbread Dressing. Thank you so much for both recipes! These are what I’ve been looking for. Hi Amy, thanks so much for letting me know. I actually just finished making my dressing for next Thursday and will be freezing it and then cooking it then. I hope you love both recipes as much as we do! Can I use yellow corn meal? Yes, yellow cornmeal will work just fine!